Over 25% of web traffic worldwide now comes from mobile, and endurance athlete participants are increasingly searching for and registering for events on the go (KPCB Internet Trends Report, 2014). Race Participants aren’t racing to register. Nearly a third of participants register for endurance events less than one month before the event. Half of participants would sign up earlier if they knew their friends were attending, so make it easy for them to get their friends on board. Be sure to enable social sharing on your registration page, and make it as easy as possible for people to register when they’re out and about talking with friends. Participants are increasingly learning about and registering for events on the go – 82% regularly search for endurance events on mobile, and half of respondents have registered for an endurance event on their mobile device. It’s crucial for race directors to optimize the registration flow for mobile devices, because even people that like a challenge don’t want to be challenged by the registration process. Make it easy for your participants to find and register for your event with a mobile optimized registration page! What was your goal for working with the Nodes Agency? Created in July 2013. , last updated in August, 2015. News feed from Facebook, web site, media partner etc. Short lists for reg., bike check-in, race morning etc. IRONMAN Mont-Tremblant (by Didjet, Inc.; created in June, 2012., last updated in July, 2015.) - This free app has been developed so that the general public, athletes and volunteers have real-time access to the information available about Ironman Mont-Tremblant and Ironman 70.3 Mont-Tremblant, related activities and services offered. View the courses so you can follow and encourage the athletes throughout the races…and quickly check the results. You can also find more information about list of particitpants, FAQ, calendar of events, course details, accommodation details and much more..
IRONMAN Regensburg (by Mittelbayerischer Verlag KG; created in July, 2010., last updated in June, 2012.) – This application provides you with everything you need to know about the event. You can access information about the participants and take a look at the course in detail. After the race is finished, we’ll provide you with all the results. IRONMAN SA (by Blue Point Events; last updated March, 2015.) - The official IRONMAN South Africa mobile app is here! The definitive interactive guide to the only IRONMAN on the African continent. View and search for registered athletes, race schedule, maps, road closures, track athletes, get race updates and live streaming via IRONMAN Live, Twitter integration and more. Plans for mobile App development of IRONMAN races? "On plans for media development: We spend a fair amount of time with international broadcasters talking about live shows … but an eight-hour pro race is a tricky live TV product. There aren’t a lot of broadcasters who have the shelf space for an event like ours. So we’ve invested in a streaming product. It’s historically been a desktop product but we have a major initiative to create a better mobile product." Andrew Messick, CEO of IRONMAN in interview in August, 2014. Challenge Roth launched in May, 2012. ‘Challenge Family” SmartPhone app, but now it’s not active! Wherever they in the world, whether at home or on the move, virtual spectators can get a variety of information and catch all the live action from any of the Challenge Family triathlons, from the world’s largest iron distance race, Challenge Roth, to the iconic Challenge Copenhagen. Live race updates, athlete tracking, race maps, results and images are all at your finger tips. Any number of athletes can be added to the watch-list function to quickly check for current standings, split times and even where to be to support them out on the course. Athletes will also find the new app useful with all the latest news and timetable of events available to keep you informed of what is going on in the lead up to race day. Also available is a full list of past results as well as a photo library for each of the Challenge Family races. Challenge Athlantic city launched mobile App in June 2014, but it’s not anymore active! The application contains the latest news around the event, locations, timetable, and other items buzzing on the internet. Soon, the participant’s information will be available in the app as well. Athletes can also enter via the app, and spectators will find information about how to reach the various hotspots to watch their favorite athlete perform. The app Challenge Almere-Amsterdam is available for download (for free) from the Apple App Store and Google Play Store. Athletes can look up the most recent information for competitors. During the weekend of Challenge Almere-Amsterdam, the latest news and information about the accessibility of the city of Almere and the various hotspots will appear in the application. Furthermore, the race results will be published via the app. Check out schedules, explore the course and find all the information you need to plan your day; View race results right after the event; Receive all of the latest event news as it happens; Connect with participants, spectators and staff to exchange tips, tricks and get questions answered: Earn points, badges and possibly even prizes for being active in the app and at the event; Check the leaderboard to see how you compare to other participants. Update - a quick way to share photos and comments about your event experience; Activity Feed - the real-time pulse of the event. See what people are saying, view photos from the event and find trending topics; Schedule - view the full schedule and related information (packet pickup, corrals); Users - see who’s at the event, and connect with them on the app; Exhibitors - find exhibitors and sponsors, and leave comments or ratings. Escape from Alcatraz Triathlon (USA; by RaceResults 360 LLC; created in May, 2012., last updated in February, 2013.) - The 2014 Escape from Alcatraz Triathlon App enables users to find event information, maps and view race results for the Escape from Alcatraz event on June 1, 2014. Aalborg Triathlon (Denmark; created in January, 2014.; last updated in June, 2014.) - It’s on Danish language. Aalborg triathlons App gives you the most relevant information (race news, results, etc.) towards the event date. LA Tri (USA; by RaceResults 360 LLC; last updated in September, 2011) - Kaiser Permanente Los Angeles Triathlon app presented by Best Buy Mobile allows user to connect with event. Users can find race information, maps, track their favorite athletes, and view race results. Race results will be available at the the touch of your fingers powered by the RR:360 results engine. Tri Brugge (Belgium; idealsystems; last updated in June, 2015) - Triathlon Brugge app lets you search and follow athletes during their race. Favorite athletes can be selected and you'll be notified of their race stages. Hell of the West Triathlon (Ireland; MYLAPS Experience Lab, last updated in January, 2016) - Official app for the Hell of the West Triathlon on 25-6-2016 in Kilkee, Co. Clare. The app contains all important event information and allows you to track the position of participants in real time during the event. Continued use of GPS running in the background can dramatically decrease battery life. The Etixx Silesiaman Triathlon (Poland; by Jcommerce SA; Created in April, 2015.) – stands for series of triathlon races and have a mobile application which support participants during the race and give them an easy access to the current results, indicate their needs for a particular nutrients before and during the competition. Many JTeam members are now having intensive workouts to be in the best condition during the triathlons. Etixx Nutrition Coach – a feature which helps you calculate the amount of water, isotonic drinks, gels and energy bars needed before, after and during triathlon. Triathlon de Verdun Desjardins (Montreal, Canada; last updated in February, 2014) - The Desjardins Verdun Triathlon is a qualifier event for the selection of the 2015 ITU World Championships, and is recognized as the fastest on the circuit Triathlon Québec. Vlaamse Triatlon & Duatlon Liga (Belgium; last updated in July, 2014) - The official VTDL Triathlon App. Here you can find all the results timed by the VTDL. PPD Beach2Battleship become in December, 2015 PPD IRONMAN North Carolina (USA; last updated in October, 2015.) - Enables racers and their families to spend time enjoying the event .They can visually travel the course with maps that show up-to-date swim, bike and run courses. These maps also display aid stations, transition locations, bike support and the finish line Visitors can find available lodging, restaurants, entertainment, and restrooms. It also displays traffic detours and viewing locations along with information about event sponsors products or services. The Beach2Battleship Mobile App puts the entire race in the palm of your hand. TriColumbia (USA; last updated April, 2013) - The TriColumbia app provides athletes with up-to-the-minute race information, maps, course videos, and other news about the Iron Girl Half Marathon, Columbia Triathlon, Rocky Gap Triathlon, Ironman EagleMan 70.3, Celebrating Heroes, TriCplumbia Kidz Tri, Iron Girl Columbia, Iron Girl Rocky Gap and ChesapeakeMan triathlon. TriColumbia provides premiere endurance events in Mid-Athlantic region for athletes of all ages and abilities. This app is powered by TriSpies, providing virtual training or actual race courses and all the intel to get you to the finish line. Try Tri Events (UK; last updated April, 2015) - The Try Tri Events App is the place to find out about upcoming Triathlon Events in your area. Currently based in Hampshire, Dorset, Oxfordshire and Surrey, Try Tri Events offer a friendly, safe environment in which to Try Triathlon for the first time. Starting with Novice Events which can be from as little as a 200m Swim, 10km Bike and 2.5km run all the way to Half Ironman distances. Already signed up for an event? Download the app to get your Race Results, Pictures, Try out our Swim Calculator and visit our Shop. Been asked to work out your swim time? Just input your time per length and our handy calculator works the rest out for you. Sign up for Events, Watch the Race Briefing videos and find out about our Open Water Swimming times. To successfully implement a mobile solution that can support your business goals, you need to consider how to plan for this so that you are successful. Understanding the goals – Quite simply, what are your objectives and how do you achieve them? Is it to finish the Ironman competition on your feet or to implement a new mobile business solution on time and within budget? How do I achieve my goal? – Start by understanding the fundamentals and learning the basics first; there are no shortcuts to success. Gain the knowledge of experts and discuss theories with people who have greater experience in the subject matter. Don’t assume your team is filled with subject matter experts. Ensure they know the fundamentals that will provide the building blocks to achieving your success on time and in budget. Milestones - Breaking any goal into achievable milestones makes it easier to plan your time and effort; these milestones can be the perfect interval to establish where you are in the plan and determine any improvements. If the plan is long term, are there new theories or technical advancements that can help now and support mobile innovations in the future? It’s time to utilize the knowledge of experts to achieve success. Moving Forward – There are constantly better methods for achieving or surpassing results. Learning from your experience to build on your base knowledge can be beneficial, but can also lead to pitfalls and start to create bad habits that will be difficult to resolve further down the road. Are Mobile App really need in Triathlon Business world? We cannot ignore the use of smartphones in sport any longer. All kinds of applications exist with training programs, and the large tournaments all provide race results through apps. With mobile app, you have all the information you need close at hand. The app informs athletes and spectators before the race but also during the weekend about all activities. Tour Tracker is, for example, is a mobile App that changes the way fans watching pro cycling since 2007, when is created. With courses often exceeding 100 miles, professional bike racing isn't exactly a spectator sport. Along the route, a fan is lucky to catch a mere five seconds of frenzied excitement as the riders zoom past. The app provides fans with real-time tracking of the racers on course maps and elevation profiles, live streaming video, live text commentary, chat rooms, race results, stage overviews and more. "We try to replicate as much about the race experience as we possibly can so a fan knows everything that's going on," says Allan Padgett, the app's creator. The success of any event depends on the coordinated efforts of all parties involved, as well as the effectiveness of the communications equipment and technology used. Large-scale events, such as professional sporting events, present a unique set of challenges and require extra precautions. This is especially true for events like Triathlons - sometimes attended by hundreds of thousands of people and spread out over many miles of expansive terrain. When the first iPhone was released in 2007, there was no App Store and the idea of a phone doing all of the stuff today’s smartphones are capable of seemed ludicrous to say the least. It was the introduction of apps that really started what we consider the mobile revolution in retrospect. According to Flurry Analytics, a company tracking usage across millions of apps, global app usage increased by 58% in 2015 (compared to 76% in 2014 and 103% in 2013).Personalisation apps (e.g. emoji keyboards or wallpaper apps) were the fastest-growing category in 2015. App sessions (that is the number of times a user opens an app) increased by 332 per cent in this category. 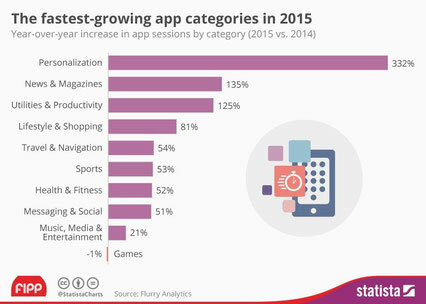 News & magazine apps were the second-fastest growing app category in the past 12 months. As smartphone screens keep getting bigger, consumers are increasingly open to consuming content on their mobile devices - a trend that publishers should be ready to take advantage of. In a survey by market researcher Vanson Bourne on behalf of Red Hat, 90 per cent of respondents said that investment in mobile apps will increase in 2016, with the average amount of investment rising by as much as 24 per cent. The survey polled 200 IT decision makers from companies in the US and EU with over 2,500 employees about mobile apps. The survey results are well aligned with our experience and findings as we see a rapidly growing demand in enterprise app development and related services. One of the biggest challenges we see for IT organisations in 2016 is the lack of internal UX/UI skills, resulting in companies making the same mistakes as they did for desktop applications with poor usability. If you are interested to find out how you can have a lot advantages with your investment in mobile app in triathlon business, feel free to contact me.